Bill No. 108 of 2011 and the need to understand the words "Naga", "Zeliangrong", and "balkanization"
The following is an extract from the article titled "Expanding the Identity Naga Nation and Threat to Integrity of Neighbouring Indian States", by Lt. Col. H. Bhuban Singh (Retd. ), which was webcast on Sangai Express in the Article section. "Hence, there is no Naga nation. Naga is a generic term for all tribal peoples living in the erstwhile Naga Hills District of Assam, because of the scanty clothes they used to put on then, but not now. The Nagas are better dressed than the majority of the Indians, at present." Furthermore, here is also an extract from the article titled "Zeliangrong Today: A Naga Tribe of Manipur" by Kamei Sanjit Rongmei and Satwanti Kapoor of the Department of Anthropology, University of Delhi. "The name Zeliangrong was formed by the combination name of kindred tribes such as Zeme, Liangmei and Rongmei. It has been formed by stitching the first three syllables together out of the three sub tribes' names. This composite name came into being with the formation of the Zeliangrong Naga Council for the first time on the 15th February 1947 at Keishamthong Imphal with the objective of closer affinity and stronger unity of Naga and for furthering the economic, socio-cultural, educational and political achievement of their tribes. This formation is strictly based on different accepted folklore and legend of their tribes. It was formed with the consent of all the leaders and intellectuals of the sub tribes of Zeliangrong. Despite all the effort to register among the Schedule Tribes of India since the formation of the Zeliangrong council, so far they are known and recognised under the tribe name of Kabui and Kacha Naga of Manipur." "According to (Kabui, 1991) it is not very clear how the name Naga was derived. Several attempts have been made by different scholars from different disciplines to trace out the origin of this word. Yet as Robinson (1969) pointed out that the derivation of the word is still obscure. Even three decades after Elwin made many observations the problem still remains unsolved. Different scholars in support as well as in counter views gave various opinions about the origin of the term, but it is still in the condition of dark obscurity to establish the real origin of the term (Gonmei, 1994). But according to Jayaseelan 1996,p.9) "whoever first called the Nagas by that name and whatever the word may mean, the Nagas themselves knew each other by the name of the tribe to which they belonged"." "From historical point of view, it seems to have been coined most probably by the British administrators during their spread of colonial rule with the policy of identifying and classifying the tribal groups of Manipur." THE CONSTITUTION (SCHEDULED TRIBES) ORDER (AMENDMENT) BILL, 2011, a bill further to amend the Constitution (Scheduled Tribes) Order, 1950 to modify the list of Scheduled Tribes in the States of Manipur and Arunachal Pradesh. Note: The word "Zeliangrong" is not found in the Bill as the Indian Constitution does not recognize the word as a tribe or as the name of a tribe of Manipur. A little discussion about the word "balkanising" as found in the news item titled "Zeliangrong community demands" webcast on E-pao.net on December 10, 2011. The article contains the word "balkanising". 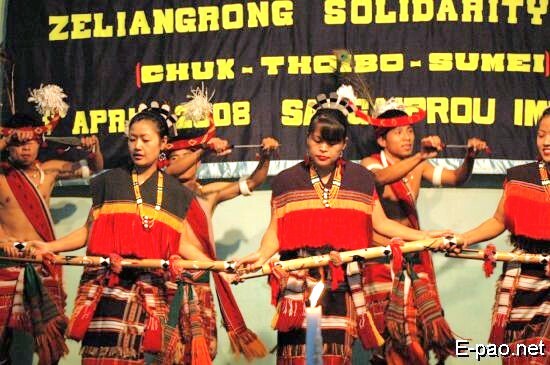 Readers have no clue whether usage of the word is purely a work of The Sangai Express, or of the Zeliangrong community, or of Zeliangrong Youth Front, or of All Zeliangrong Students' Union. Microsoft Encarta World English Dictionary defines the word "balkanization" as division into hostile subgroups: division of an area, region, or group into smaller and often mutually hostile units. Now, from the article of Kamei Sanjit Rongmei and Satwanti Kapoor, there are only there sub tribes of Zeliangrong viz. Zeme, Liangmei and Rongmei. So, if we take into consideration, the article and the Bill together, Inpui, Thangal, and Mate are the three tribes added – from the perspective of a Zeliangrong. But the word "Zeliangrong" is not found in the Bill at all, and so from a Constitutional point of view it would come to conclusion that the six tribes contained in the Bill have nothing to do with the word Zeliangrong. The Bill merely added and recognized six communities as Scheduled Tribes. It is clearly stated in the news item as "balkanising the Zeliangrong community into six different entitles, (sic) entities" so the new three tribes also belong to Zeliangrong, at least from a Zeliangrong community standpoint, and also the six groups should be hostile to one another as the word "balkanising" connotes. If there is no hostility involved among the six tribes, the word "balkanising" should never be used in such a context. But is there really a division involved? I don't think so because these tribes have been in existence since time immemorial as different and separate entities, and consequently, the addition of the six tribes in the list of Scheduled Tribes does not involved an ethnic division and hence no process of balkanization. This article was posted on December 16, 2011.